Clocktower reissue produced by Brad Osbourne. Watty Burnett tune produced by Lee Perry circa 1975. Colored vinyl triple 10" in a nice magnetically-sealed box. 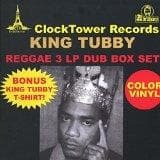 Triple colored vinyl compilation with a free KING TUBBY t-shirt!